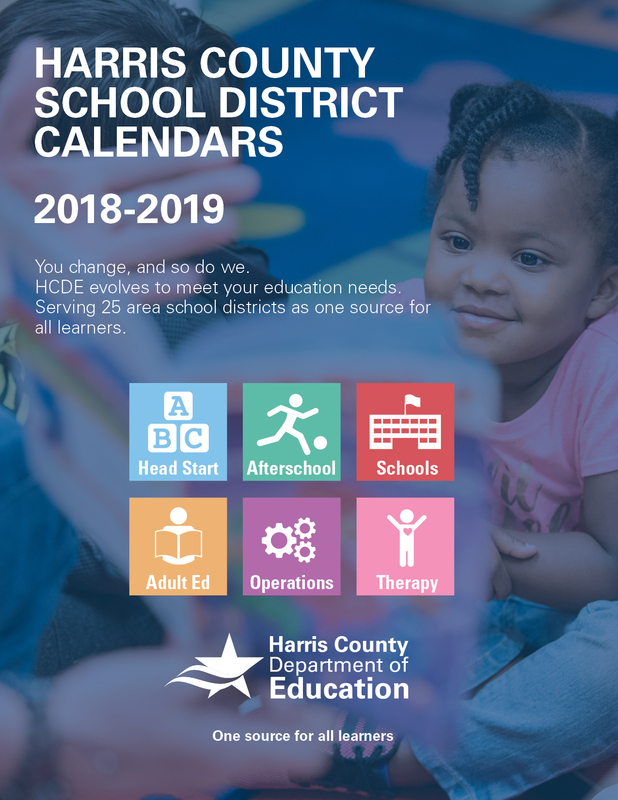 Key dates for the 2018-2019 school year for all 25 school districts in Harris County are available through the Harris County Department of Education comprehensive school district calendar. Some districts begin school as early as Aug. 16, and many start on Aug. 27. All 25 districts are off for Thanksgiving from Nov. 19-23. Winter break begins as early as Dec. 20 at several districts, but most return to school by Jan. 4. Spring Break is March 11-15 for all districts, and Easter break varies throughout district calendars. Staff work days and other holidays differ. Districts begin wrapping up the year from May 23-31. About Harris County Department of Education: HCDE provides special education, therapy services, early education, adult education and after-school programming. Services are funded by government grants, fees and a local property tax of approximately $9 per homeowner. For every dollar in local property tax collected, HCDE provides $4.40 in services to the 25 Harris County school districts. We operate four campuses for students with profound special education needs and adjudicated or recovering youth who require a low, student-teacher ratio and highly structured environment. One-hundred percent of students served on HCDE campuses are at-risk. We are governed by an elected board of seven trustees and have 1,076 employees and 33 facilities, including 15 Head Start centers. More info at www.hcde-texas.org.